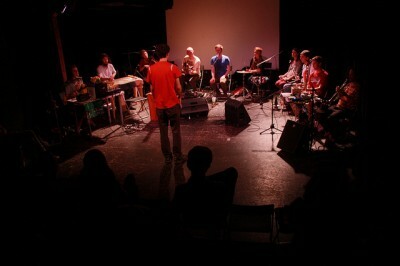 Improvisation Symphonic Orchestra based in Bratislava (since 2006). Conservative principles in music are often described as dead. But musically dead can also be the Describer, practically the one, that complains about the actual state of music. So who is really dead? The answer to this question will be given by histories in the future. We are actually too young to give answers to such questions, but our goal is to bring perhaps just a bit of light by our improvised music into the problem. Musica falsa et ficta practices conducted collective improvisation. It is a group of about 25 young musicians, mostly studying at the State Conservatory and at the Academy of Music in Bratislava, plus guests. Each of these musicians brings his own personal view of music into the proces of improvisation. We try to combine music created by classical instruments with electronics (laptops, effects, …) and we move on the edge of composition, improvisation and interpretation in real time.